Introducing EchoPost™, a revolutionary marketing tool that combines the best direct mail practices with an innovative digital prospecting tool. EchoPost™ captures the household’s web behavior, along with other data, and matches it back to their physical mailing address. Then a targeted mailer is sent to that household within 24 hours after the initial site visit. Retargeted digital ads are also served to that household, so when the mail piece arrives in home they’ve got something in their hand that grabs their attention! It’s retargeting that hits home. By reaching the people who are actively looking for your product or service, EchoPost provides an intelligent, multi-channel approach to lead generation, prospect engagement, and follow-through. 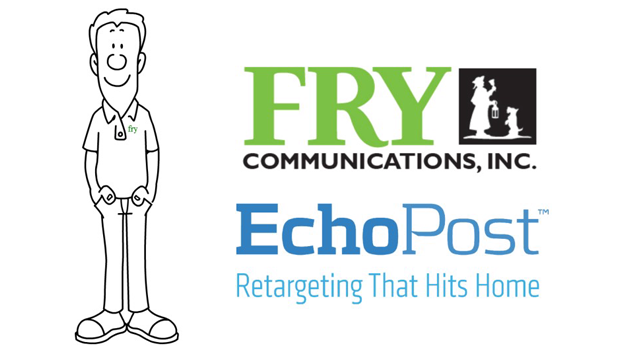 EchoPost is not targeting prospects based on historical data or profiles. EchoPost is targeting prospects who are visiting you online NOW. That’s a hot lead! One regional auto dealer saw a 64% improvement in response rate when IP targeted prospects received direct mail along with digital ads. A non-profit client realized a 70% increase in donations. A luxury products ecommerce company saw a 5% conversion to orders after sending an EchoPost postcard to anonymous site visitors. Print reinforces the message of quality and craftsmanship, luxury and worth. People take more time to absorb a printed piece, to hold it and read the messages and feel the paper. They connect with the message and the brand. Direct mail leaves a lasting impression. It doesn’t matter if the potential buyer is holding the object or a picture of the object; simply holding your message in their hand is the first step to owning it. EchoPost enables you to reach out with that powerful touch and convert your anonymous visitors into hot prospects.